For more than two decades SBEnrc and its predecessors have been partnering with industry, driving research focusing on the uptake and benefits of digitising the supply chain of project delivery. This Australian research initiative has been consistent with industry’s call for value-adding information and communication technologies for construction and virtual prototyping for design, construction and operations identified in Construction 2020 - A Vision for Australia’s Property and Construction Industry. As early as 1998, the Construction Research Alliance (CRA) - led by SBEnrc CEO Keith Hampson - embarked upon a project that explored environmentally sustainable development using IT (ESDIT). The CRA was at the forefront of Building Information Modelling (BIM)/Digital Engineering (DE) and the ESDIT project was a forerunner to digital assessment of the environmental impact of building design and performance. The CRA worked closely with Australia's CSIRO to bring the International Alliance for Interoperability (IAI) to Australia in 1998, giving our national construction industry its formative experience with BIM/DE. The IAI went on to become buildingSMART International, a thriving global organisation dedicated to standardising processes, workflows and procedures for BIM/DE. In the meantime, the outcomes of the CRA’s ESDIT project fed into the research program of the Cooperative Research Centre for Construction Innovation (CRCci) which was formed in 2001. In 2009 it released the National Guidelines and Case Studies for Digital Modelling (Buildings) under the industry leadership of Thom Fussell from the Queensland Government’s Department of Public Works. We firmly believe that the digital transformation in Australia's built environment represents a major opportunity to improve the businesses of Australian constructed asset owners. Our National Industry Research Workshops scheduled for July 2019 will tap into future industry priorities for ongoing development of applied research benefiting whole-of-life value through digitisation. We continue to build on long term relationships and the legacy of valued outcomes achieved over the past two decades to apply to today's changing business world. Our Centre’s work in this digital space in design and construction, and now in asset management, continues to benefit the community through more effective delivery of built environment facilities such as homes, schools, hospitals and infrastructure. Launch Event - register now! Join us for the launch of the essential guideline for supporting the operation and maintenance of key assets. 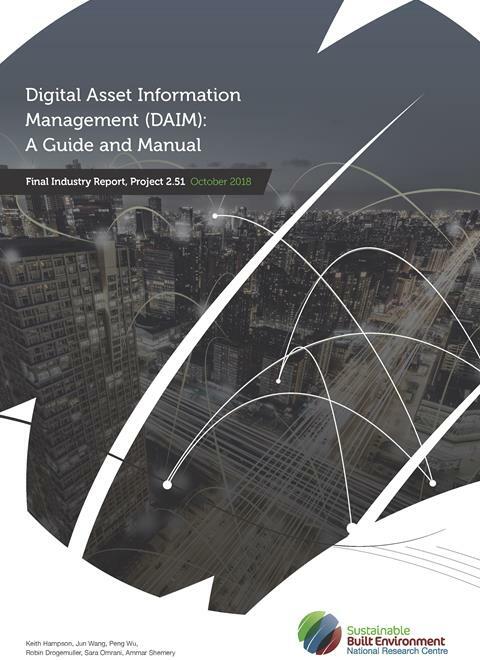 Digital Asset Information Management: A Guide and Manual is the culmination of research undertaken in SBEnrc’s Project 2.51 - Developing a Cross Sector Digital Asset Information Model Framework for Asset Management. We regularly hold workshops around Australia to gather the latest perspectives on industry’s challenges and innovation needs. The workshops provide a forum for professionals from across the private sector and government to share business challenges that could form the basis of our future research projects. Researchers gain an appreciation of the problems faced by industry professionals and collaborate to develop ideas for projects that can be applied to the real world. This rapid translation of industry problems to SBEnrc projects uniquely identifies the continuing relevance of our Centre's research partnerships. International Council for Research and Innovation in Building and Construction (CIB) presents the CIB World Building Congress 2019, Constructing Smart Cities, 17-21 June 2019, Hong Kong, China. Ideaction - National FM Conference & Exhibition, FM Forecast, Blue Skies, Clouds or Storms, 2-5 June 2019, Sydney, Australia. Transport Australia Conference 2019, Shaping Australia's Transport Future, 27-28 June 2019, Sydney, Australia. World Engineers Convention Australia 2019, 20 - 22 November 2019. Known as the ‘Olympics of Engineering’ this international convention is held every four years and will attract global participants from over 70 countries. The convention program will offer three full days of content featuring six themes, with each aligning to the 17 United Nations Sustainable Development Goals. Hosted by Engineers Australia and World Federation of Engineering Organizations. As is customary, we held a senior networking dinner in parallel with the Board meeting in Perth. Amongst other luminaries, this dinner was supported by the attendance of the Western Australian Minister for Innovation, ICT and Science, The Honourable Dave Kelly, MLA, and WA's Chief Scientist Dr Peter Klinken AC. Such influential industry and government leaders facilitate the ongoing industry government and research engagement, advancing Australia's built environment.